Regina McMichael delivers the opening keynote on Day 1 of Safety Summit 2019. The conference kicked off with an opening keynote from Regina McMichael, president of The Learning Factory. 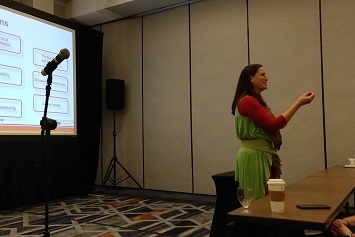 In her session, The Wife Left Behind: The Making of a Safety Professional, McMichael related her story of how, at only 20 years old, she found herself planning a funeral for her husband after he fell from a roof while working on a jobsite. She would later go on to play a vital role in drafting the OSHA fall protection guidelines that could have saved her husband, regulations that would be published in the Federal Register nine years to the day after her husband’s death. McMichael emphasized the importance of the human element in the safety world, noting that it is the duty of the safety professional to truly care about coworkers and employees and do the best that they can to ensure that they go home safe to their families every day. Compliance is important, but it isn’t enough—to truly succeed, safety must be rooted in our common humanity and a genuine, heartfelt understanding that it is essential within the workplace. McMichael touched on some of these subjects in a recent EHS on Tap podcast episode, available here. After the opening keynote, Daniel Deacon from Conn Maciel Carey LLP shared some of the latest updates out of OSHA along with trends in enforcement. Ranging in topics from speculation on the possibility of the confirmation of Scott Mugno as head of OSHA to the latest on increases in enforcement penalties, Deacon provided the audience with a picture of what they might expect on the safety compliance front in 2019 and beyond. Joe Tantarelli delivers the Day 2 opening keynote address at Safety Summit 2019. 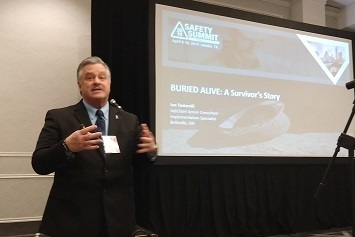 After recognizing our latest winners and runners-up in a Safety Standout Awards ceremony, SafeStart’s Joe Tantarelli delivered his opening keynote, Buried Alive: A Survivor’s Story, wherein he recounted a trench collapse incident that nearly ended his life. In addition to discussing the physical and emotional aftermath of the incident, Tantarelli shared the common behavioral factors (including rushing, frustration, fatigue, and complacency) that contributed to result in such an accident. By sharing these insights, Tantarelli hopes that attendees will be on the lookout for such issues at their own workplaces—and will take steps to prevent life-changing, tragic events from happening. Safety Summit 2019 would like to also thank our sponsors and exhibitors: SafeStart, Avetta, Portacool, Veriforce, Bulwark, Dakota Software, Crisis Prevention Institute, CLPS, and OverNite Software. Thanks also to our speakers and attendees for making this a great conference—we hope to see you next year at Safety Summit 2020!